The blue-headed vireo sang to me of spring sometime around the first week of April. Blue-headeds are generally the last “non-resident” songbird we hear in the fall (sometimes into November) and the first we hear in the spring – probably due to the fact that many overwinter in the warmer climes of the Southeast. But the liquid, slow trilling, “can you hear me?” is a sure sign that Neotropical nesters are on the way home to their nesting grounds. On April 14 I heard the first flute-like “eee-oo-lay” announcing the return of wood thrushes to the woods adjacent my home. A black-throated green warbler showed up on the next day. On April 18, the rising “zzeeezzeeeezzee” that breaks off at the end with a sharp “tsip,” let me know that a northern parula was surveying the landscape. I have had one nest in the front yard for the last two years. Last Friday morning I was snoozing in and out on the couch after a 12-hour work night. The rain was falling, drawing a grey curtain around the large windows, making for perfect napping – but, somehow, a jolt of color grabbed my attention. 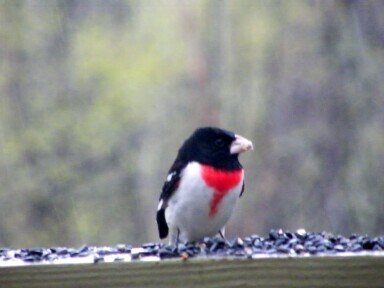 There in the platform feeder, digging through wet black-oil sunflower seeds, aits crimson breast shimmering in the rain was my FOY (first-of-the-year) rose-breasted grosbeak. Without banding, there’s no way of knowing if these particular grosbeaks will be the same ones that nest in my woods; flit in and out of my feeders all summer and bring their young for buffets in the autumn, but I do know that I will share my yard, feeders and deck with these striking creatures from now till October. I don’t know if it was that same rainy day or the day after that I was headed to town and a silhouette caught by eye; standing on a limb at the side of the road was the small slim shadow of a broad-winged hawk. One of two truly Neotropical raptors (Swainson’s hawk is the other,) the broad-winged also spends the summer in the woods adjacent to my home. Even though the nights this past weekend flirted with or dipped below freezing I knew that with the company I had, ruby throated hummingbirds could not be far behind. On Saturday, April 20, I filled my hummingbird feeders and put them out. Sunday morning after breakfast, I walked past the bedroom window just in time to catch a male ruby-throat bent over the feeder inhaling a beak full of sugar water. It’s clear that spring is here but I still have a few summer residents that I am anticipating. I haven’t seen a single flash of crimson or heard the growling “chickkkburrr” of a scarlet tanager yet. And while I don’t need any competition for lazy – I’ve yet to hear the “I am sooo lazzeee” of the black-throated blue warbler.